A firm favourite with UK homeowners, gas fires have maintained their popularity for a variety of key reasons. The range of styles, finishes and designs available mean that we are confident that we have something to suit every home. In addition to being one of the best interior design choices you will ever make, gas fires are an exceptionally practical and low-maintenance option, making them genuinely impossible to resist. Here at The Fireplace Warehouse, we pride ourselves on the diversity of our range and the choice we provide to our customers. We also believe in providing easy access to our free, expert advice to ensure that finding your ideal gas fire is a seamless and enjoyable experience. When browsing our range, you will find that standard gas fire models are available in an array of shapes, sizes and styles. In addition to sleek and simple models that will fit beautifully into any space, we have a selection of traditional models and ultra-modern designs to ensure you won’t ever have to choose between form and function; we believe that you can, and should, have both. Renowned for the warm and homely ambience they create, gas fires effortlessly become a beautiful focal point that will really anchor your space and transform it into a calming place in which you will find it easy to switch off, relax, and enjoy your leisure time. If you are looking for a model that will embody the natural beauty and appearance of a real fire, a living flame gas fire will provide you with the same restful ambience in a much more convenient and fuss-free manner. These are supremely easy to keep clean and maintain, with many modern models even including a remote control that will enable you to create your desired atmosphere directly from the comfort of your sofa. Functional and beautiful, a living flame gas fire is the ideal choice for everyone who wants to enjoy the best of both worlds. Smaller spaces can also enjoy this warm and cosy ambience by selecting an inset gas fire with a smaller footprint. 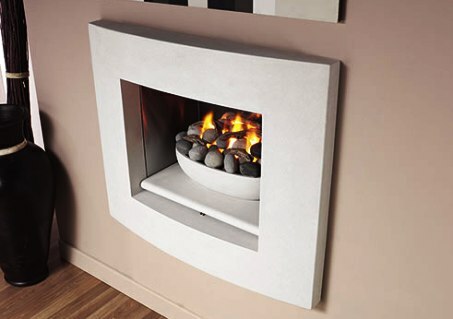 Many inset gas fire models are incredibly versatile and are suitable for most spaces; however, if you are especially tight on space or have a class 2 or pre-cast flue installed within your home, choosing one of the newer slimline designs will ensure that you can achieve your chosen aesthetic without losing any precious floor space. These models will only project slightly from your wall, creating a striking focal point without visually overwhelming your room. We recognise that functionality and efficiency are crucial, which is why we stock a comprehensive range of LPG gas fires in an array of styles and finishes alongside our range of natural gas fires. We have made sure that every model we stock delivers a superior performance. Whether you require LPG or natural gas fires, we have something that will meet your needs and suit your style perfectly. If you don’t have a functional chimney, no problem! We don’t want anything to stand in the way of you achieving your desired aesthetic. Our range of brass fires is smart and characterful and will fit seamlessly within both traditional and vintage-inspired spaces. Many of our models are available in a variety of decorative fuel bed options; therefore, whether you are looking for LPG gas fires or models with natural gas capabilities, we can help you to achieve the look you are hoping for. Realistic ripped coals enhance the look of traditional styles perfectly, with many models enabling you to customise your fireplace by selecting from driftwood, woodland logs, pebbles and rounded coal options. Whichever style you choose will effectively introduce additional warmth and personality into your home. If you are looking for something more contemporary, our collection of brushed steel, shiny chrome and statement black gas fires with clean lines and sleek designs will effortlessly complement a variety of modern aesthetics, from bold monochrome to simple minimalism. Many modern designs can be set securely into your wall at any height without necessarily requiring a traditional floor-level hearth. This offers additional versatility and gives you even more control over the placement and the atmosphere you want to create. We stock all the leading brands here at The Fireplace Warehouse, including Legend, Gazco, Crystal, Nu-Flame, Matchless, Paragon and Flavel. Whether your space is large or small, let us introduce you to the perfect gas fire for you and your home.